Color A, cast on a multiple of 6, + 3 sts. Row 1 - RS: Color A, knit. Row 2: Color A, purl. Row 3: Color B, k4, * s1 1 wyib, k5; rep from * to last 5 sts, sl 1 wyib, k4. Row 4: Color B, k4, * sl 1 wyif, k5; rep from * to last 5 sts, sl 1 wyif, k4. Row 5: Color B, p4, * sl 1 wyib, p5; rep from * to last 5 sts, sl 1 wyib, p4. Row 6: Color B, k4, * sl 1 wyif, k5; rep from * to last 5 sts, sl 1 wyif, k4. Row 7: Color A, knit. Row 8: Color A, purl. Row 9: Color B, k1, * sl 1 wyib, k5; rep from * to last 2 sts, sl 1 wyib, k1. Row 10: Color B, k1, * sl 1 wyif, k5; rep from * to last 2 sts, sl 1 wyif, k1. Row 11: Color B, p1, * sl 1 wyib, p5; rep from * to last 2 sts, sl 1 wyib, p1. Row 12: Color B, k1, * sl 1 wyif, k5; rep from * to last 2 sts, sl 1 wyif, k1. 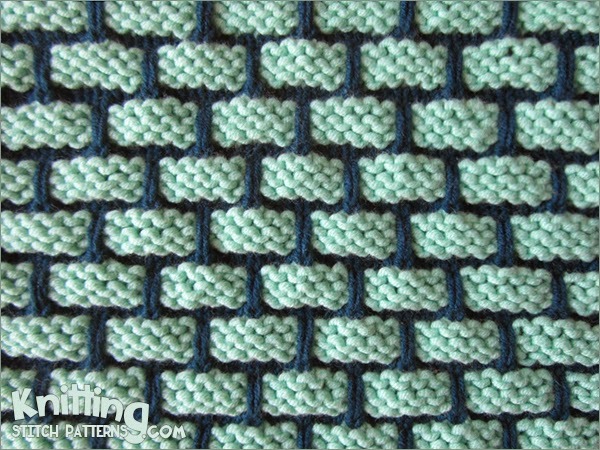 Repeat Rows 1 - 12 until desired length is reached finishing with rows 1 and 2.